Oncidium Sweet Earsis ‘dancing doll’ type Oncidium that is not difficult to grow if you follow our tips. It is a cross between two Oncidium hybrids: Sweet Sugar x Cloud Ears, hence the name. The flower is a fairly typical for a ‘dancing doll’ type Oncidium: bright yellow flowers with variable darker brown markings and a large lip, but, nevertheless, its an improvement over other similar Oncidiums. There are several clones of this hybrid available, and most should be easy to grow. The plant shown to the left is a young plant blooming on a single mature growth in a 3.5″ pot. 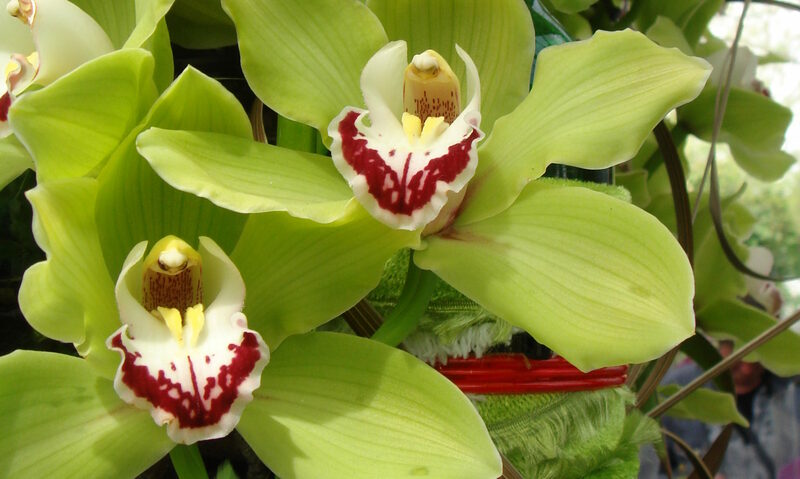 It exhibits a compact ‘Christmas tree’ or candelabra flower arrangement that breeders are striving for when it comes to orchids for the houseplant market. Oncidiums have been bred for many years and the goal is now to produce plants that are more compact than the species which can grow to be very large and often have very long unwieldy flower spikes. Read on to find out how to grow these oncidiums as houseplants on your windowsill. You can grow dancing doll onicidiums in bright light in a slightly shaded southern,west or east facing window. Allow them to dry out slightly between waterings, and fertilize regularly during the growing season. They will bloom on a mature spike, generally in the cooler months. the flowers last several weeks each, and flowers on the branched spikes will open sequentially resulting in a long lasting display of blooms. After flowering, restrict watering and fertilizer slightly, until you see new growth emerge at the base of the mature bulbs. The clone photographed is Oncidium Sweet Ears ‘The OrchidWorks’ which was patented by James McCully a grower in Hawaii. Apparently, this clone was selected for its superior qualities from 120 plants. There are many ways that breeders can benefit from discovering, or breeding, a superior plant. I do not believe that patents should be granted for such orchid ‘inventions,’ unless there is a mechanism to share the economic benefits resulting from such a patent with the breeders who bred the parents used to create the patented plants, not to mention the countries from which the parent species were first removed from, without permission and without any compensation; an impossible task once you think about it. Nevertheless, tissue cultured plants like these are often widely available for reasonable prices. This plant, for example, was purchased at Trader Joe’s. See the close-up of the flower on a second blooming (above right) of the same plant, the year after the main photo and the close-up (below left) were taken! The flowers are significantly larger(some of them almost twice the size as the year before) , especially the lip. The coloring is also more intense though that is affected by growing conditions, especially temperature and light. This year, our plant had three branches, but apparently more than five branches are possible. The lesson here, is that it takes several years for orchid plants to bloom to their full potential. Grow the strongest, most robust plants you can and you’d be amazed at the quality and quantity of flowers that you will get!